Me and my mother....This was the theme of the performance by Rachana Yadav Dance Studio at the Shriram Centre Auditorium, Delhi. Adolescent love is not easy to handle. The hormonal changes, the upheavals in mind and body all are intertwined into a complex cycle of haves and have nots. Who love and for what reason makes you a perennial doubting Thomas. For parents it's a double challenge. If you are as liberated as the mother in Mannu Bhandari's story Trishanku you feel for what are you toiling in life. Your life holds as much weight as your life plans. Who is the rider and who is riding the wave of youth? The Gundecha brothers sought Mannu Bhandari's thought in raag Yaman. 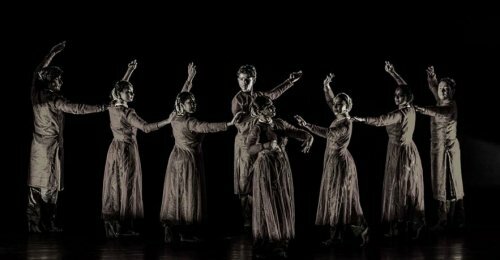 For the initial part of dhrupad in alaap, the dancers Nidhisha, Subhi, Sweta and Rohit performed in perfect symmetric movements in upper part of the body only and the play of lights on the dancers. The heat generated in an uncertain step one takes to grow from a bud to a shrub was what one felt as one with the strains in Yaman. The sparkle of youth was changed into a youthful Sudha Sarang poem that ran for a brief few minutes. The raag Megh alaap and the various entries and exits of the dancers were projected with some dramatic episodes like the mother discovering the secret letter by the girl to the boy and all the effects of light, pakhawaj and emotional upheavals were explored beyond the space of only tatkars and short poems defining the mood of the story. 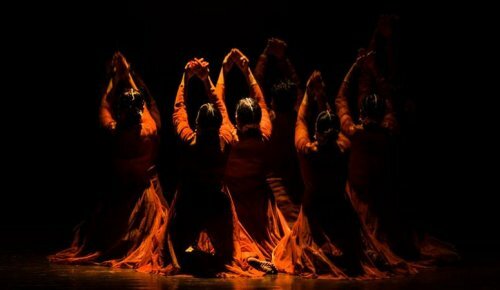 Agreed, it would have effected and crossed the lines of the rigidity of Kathak but Rachana Yadav's young dancers were already emoting with their feet and patterns and what difference would it make if few dialogues were exchanged between the central characters? Rachana Yadav, as the liberated mother, did give us an effective impression of a ruminating mother who was torn between tradition and modernity. She effectively highlighted at places how she was going through a vortex of emotions. The dancers and she represented two sets of generations in separate short pieces of their own. The juxtaposition that stood unanswered could have been shortened into more crisp and shorter duration. The Gundechas are dhrupad maestros so taan-daari wasn't incorporated into the recorded music. The evolution of ideas and turmoil of the girl was therefore handled with the, at times, jarring pakhawaj thekas. The entire show didn't step once into prioritizing whether it was a dramatic story, a pakhawaj recital or a pure Kathak piece set to few taals. Each when played was leaving the rest of the medium behind. Overall, it was a heartfelt attempt on paths of motherhood. Kasturika Mishra is a cataloging specialist librarian, writes reviews on the performing arts, and is advisor to Kalinga Literary Festival, Bhubaneswar.